We hear the Quiet Song that whispers in the blackness of Yin. We are cold, yielding and unemotional. Our knowledge is supreme and our powers terrifying. We see the ancestors' ghosts and honour them. We are silent and deadly, scholar-assassins and mystics of the Yellow Springs. Do you understand our riddles? Do you fear our ways? 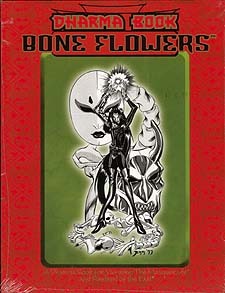 Dharma Book: Bone Flowers is the second in the Dharma Book series for Kindred of the East. It is a complete guide to playing the dark scholars of the Kuei-jin. New rites, Disciplines and artifacts, prominent teachers and their secrets, this book provides everything you need to sing the song of the Shadow.